Tree removal is the act and process of removing a tree from its location either due to damage, sickness or potential risk to life and property. It is always best done by professional tree removalists. North Brisbane Trees are experts in the art of tree removal and we specialise in large, dangerous and confined space tree removals. We can even remove trees entangled in power lines. If you need someone to remove a tree from your yard, garden or property in Brisbane, we’re the only ones you need to call. We are fully equipped to remove the whole tree, stump and all. This means you will be able to re-use the area of your garden where the tree once stood. Or if stump removal isn’t necessary, we’re able to use completely safe and approved chemicals to kill the tree. We provide a 100% guarantee that the tree will die immediately. North Brisbane Trees offers a comprehensive service and the best tree removals Brisbane has ever seen. We are also the ONLY tree services company located in the Greater Brisbane area that is equipped with a large crane. Our crane has a whopping 22m reach and allows us to complete tree removal in both a safe and efficient manner. 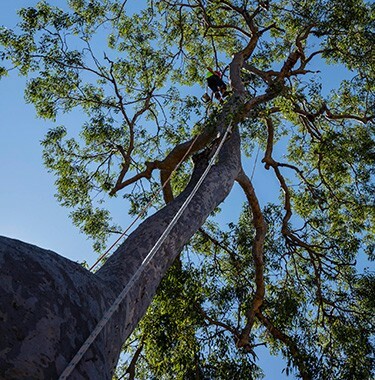 We are also one of only a handful of tree service providers who are qualified contractors AND qualified consultants with the QAA (Queensland Arboriculture Association). A list of the approved Qualified Contractor and Consultants can be found on the QAA website. We are fully insured with $20,000,000 public liability insurance. Don’t risk it with other operators with less or no insurance! It’s never worth it. Trust only us for Tree Removal in Brisbane. We recycle all plant materials in the process. Our massive 24 inch capacity chipper (one of Brisbane’s largest chippers) can turn a dangerous tree into useful garden mulch or firewood in a flash. How much does tree removal cost? The price of tree removal depends greatly upon so many factors related to the tree or trees so it’s best to talk to us and we can work out an affordable tree removal rate for you. Get in touch – call us on (07) 3289 3610 for an obligation free quote on our Brisbane tree removal services. Cutting down trees can be an emotive topic but sometimes removing trees is unavoidable to ensure the safety of people and property. Trees can become infested with pests and disease, making them weak and brittle. They can also pose a safety risk due to their size or age. Tree branches overhanging homes or power lines can cause significant damage, especially during the Summer storm season here in South East Queensland. Palm trees can also be dangerous when their fronds fall to the ground. This is particularly so if they are planted near outdoor play or entertaining areas where the falling fronds could land on somebody, causing considerable harm. In this situation, total tree lopping of the of the palm is recommended to ensure the safety of people first. However, it’s not just the parts of the tree you can see above ground that can cause harm. The most destructive part is usually underground. Tree roots can crack and lift foundations, concrete paths and paving, driveways, and swimming pools. They can also interfere with pipes and other underground utilities. These problems usually arise from planting the wrong species in the wrong spot. Some trees have massive root systems to anchor their large crowns or to satisfy their thirst for moisture. Trees with root problems will usually show signs of stress above ground. The leaves may become less shiny or change colour (usually a brown colour), bark may start to peel off, whole limbs can die off suddenly, or the tree may start to lean. A leaning tree is a sign that the tree’s roots are losing their ability to anchor the tree to the ground. Palm trees are prone to being partially uprooted when planted incorrectly or when soil erodes. This often occurs when weeks of heavy rain are followed by an extreme wind event. Once a palm tree becomes partially uprooted, complete tree removal is usually the only viable option because transplanting palms can be very expensive. 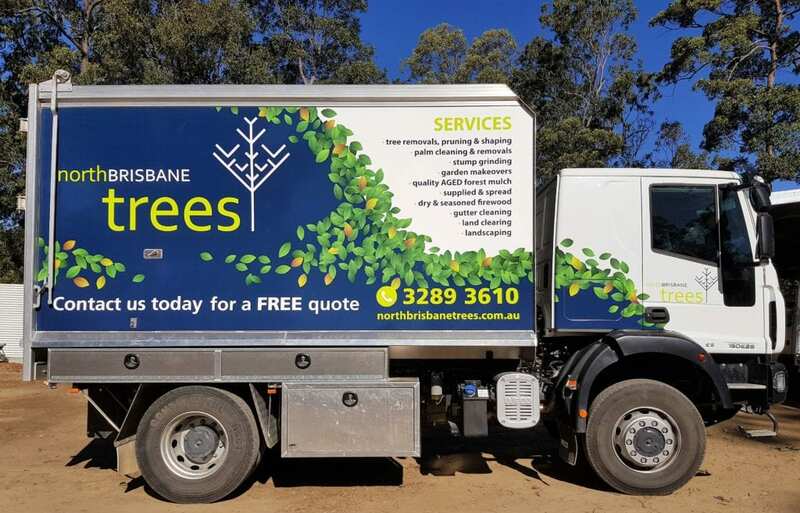 Before you contact North Brisbane Trees for a tree removal or tree lopping service, check with Brisbane City Council or your local council to ensure there is no Vegetation Protection Order (VPO) on your property. If there is you will need to apply for a permit to remove a tree. However, if a tree is posing an immediate danger it can be removed without permission. A photo will need to be taken of the tree before it is removed and disposed of. Refer to the Brisbane City Council’s website for further information on the Natural Asset Local Law 2003 as BCC has recently proposed changes to this law. Property owners wanting to hire North Brisbane Trees for land clearing should first refer to the Queensland Government’s Vegetation Management Act 1999. Tree lopping is the process of removing parts of a tree as opposed to the entire tree itself. Tree lopping is always best carried out by experienced tree loppers. Sometimes whole tree removal isn’t necessary and we can save a tree by just cutting (or ‘lopping’) off the damaged or unwanted branches. For example, if a tree has been only partially damaged by a lightning strike, or if only a few branches are causing a problem. However, not all trees respond well to lopping. There is a risk that the tree could suffer further damage and possibly die. A tree’s recovery from lopping is dependent upon the species of tree, its age, and its health. We can advise you which option — tree removal or tree lopping — would best suit your tree following an on-site inspection. The cost of tree lopping is dependent on the size of the tree and the nature of its branch growth which determines how complex the job will be. Talk to us and we’ll give you an affordable tree lopping quote that’ll make you smile. North Brisbane Trees provides an all-round service from the best tree lopping Brisbane people. Get in touch – call us on (07) 3289 3610 for an obligation free quote on our Brisbane tree lopping services. We also provide ‘less radical’ tree pruning and trimming services, which can proactively encourage healthy growth in your trees.